My paying job sent me to India for a third time, but this trip I was fortunate enough to be sent to Bangalore (Bengaluru). Being the person I am, as soon as I found this out I looked to see if there were any breweries or brewpubs I could visit while there. Bangalore is the home base of United Breweries, makers of Kingfisher, but wasn't too interested in that. I found two that were true craft breweries. I sent both of them messages asking if it were possible to visit and see their brewery or even meet the brewer. Sibi from Toit replied back very quickly (impressively so, considering it was a Facebook message) letting me know when I could come by, the other gave a generic response about a 10AM formal tour and 3 course lunch. Sounds nice, but working nights here, that time was way too early. So I decided Toit would be where I stopped. Toit is located on 100 Foot Rd which I found out is one of the higher-end retail areas of the city. I arrived and immediately name dropped, asking if Sibi was available. He was busy at the moment so they sat me and I ordered their special brew, Pataka, which is a brown ale. Excellent flavor, and was not as heavy in the mouthfeel as browns can tend to be. I was waiting on a former colleague of mine from Delhi that had changed jobs and moved to Bangalore before I ordered food. Except for being marked as “veg” and “non-veg” it could have been from any place in the US. BBQ chicken, pizza, potato skins. All the things that make a spoiled American feel at home. Sibi was still busy and my friend hadn’t shown up yet so I ordered their Colonial Bitter. It was excellent, bordering on pale ale territory. Around that time my friend Sudarshan arrived, followed immediately by Sibi. We got through the pleasantries, and started talking beer. 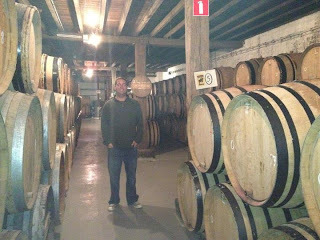 Toit was started by Sibi and two of his life-long friends and an investor. The name has a fortunate double meaning. He explained that originally it was a joke among the friends from the Austin Powers movies, where there’s the line “Tight as a tiger” with tight pronounced toit. Also, in local slang, tight means drunk or feeling good. He brought over their brewer, Matthew. He’s native Irish, but immigrated to the US and served in the military, then moved to Denmark. Currently he lives in the Philippines, but took the job in Bangalore a few months ago, and considers himself semi-retired. They brought me over samplers of their other beers, a red, a weiss, and a stout. They said the stout is the number one beer women order there. I told them they must have great taste because I ordered a full glass of it. 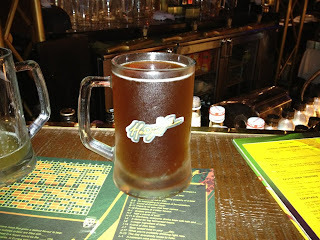 Matthew also went back and got a sampler of their Tintin from the fermenter which is their hefe. I’m normally not a fan of hefes, but it was fantastic. I also learned that originally Bangalore was used by the British as a military headquarters. They started United Breweries there to have beer for themselves, and as the city grew it became a destination for people to come and have draft beer, which was a rarity in India. So there’s a brewing tradition in the city that I had no idea about. Sud and I ordered some pizzas and while they cooked, Sibi and Matthew showed us around the brewpub. It has 3 levels. The middle level is a bar that’s opened up in the evenings when it gets busier. The top level has two sides. One side is a more family-friendly dining area, the other side has a bar that allows smoking and the pizza ovens which are wood-fired are located. We saw our pizzas pulled out so we headed back down to eat. The pizzas were great, the best I’ve had in my trips to India. We finished stuffing our pie holes, and Sibi came to say goodbye as he had to get home. Matthew came over and sat with us talked for a good hour about his travels, experiences, and the future of the brewpub. The place was busy from the time I got there at 2 in the afternoon until we left around 7 in the evening, and was getting even busier. Obviously it’s struck a chord with the local population. I don’t know if I’ll ever get a chance to return to Bangalore, but if I do, Toit is a must-stop location. I can’t recommend it enough. 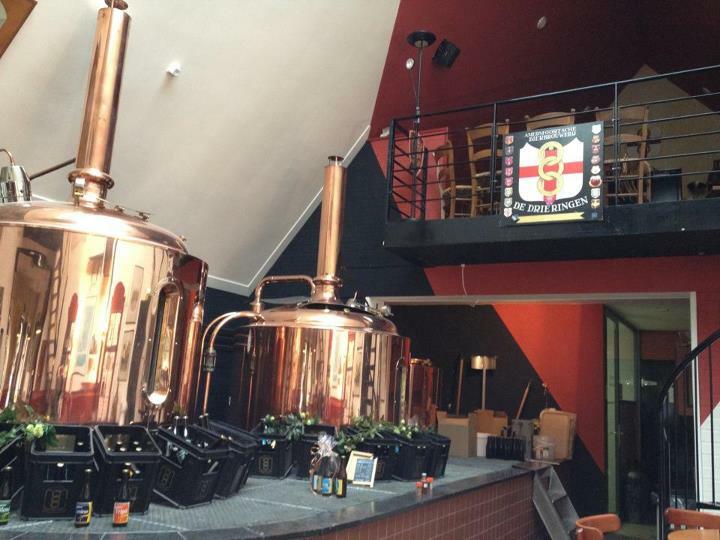 Great beers, great food, great building, and great people. 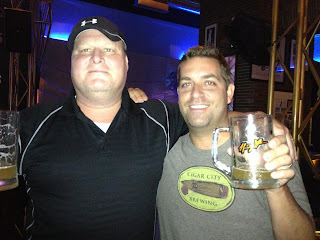 Even on the other side of the planet, the same culture and friendliness we in the US have come to know in the beer community exists. Oh yeah. I also went to India. Noida, specifically, a suburb outside of Delhi. India is not much of a place for good beer. The people there were really nice, but as far as beer, they still have a ways to go. If you remember, Tim wrote about it back in 2010. He went to a couple of brewpubs there, including Howzatt, which is the one that I went to with my friend Rob (but not Rob from Beer Trip fame) during my time in India. I’ll get to that in a bit. After getting in India, I realized quickly that I should have brought some beer with me. At the hotel, my beer options were Kingfisher, Tuborg, or Carlsberg. Basically my options were three different pale lagers, which isn’t anywhere close to being my favorite style of beer. It was fine for what it was, but after a few days, I was ready for something else. So I talked to Rob, asked him if he wanted to go to a brewpub with me and get better beer, and he was down. So we called a cab, and headed to Gurgaon. As seemed to be the case in India, whatever ever time that the driver tells you that it will take to get to a place, plan on it being double. The day before, we went to the Taj Mahal, and while it’s a beautiful building and it was a great experience to see it and walk through it, I wasn’t particularly happy about the trip taking almost six hours each way when told that it would be about two and a half hours. So naturally, our “45-minute” ride to Howzatt took an hour and a half. 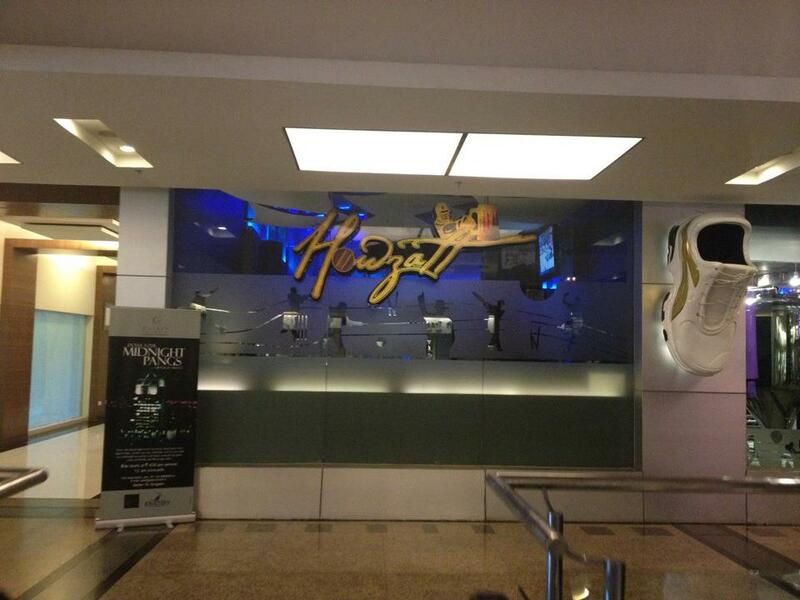 Howzatt is located in the Galaxy Hotel, which when entering looks more like a mall than a hotel. 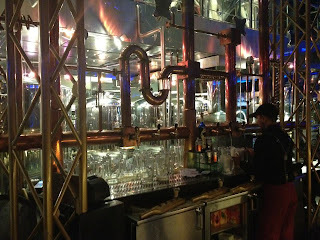 It was really a nice looking place, very clean, and the brewpub was on the second floor just off the escalator. Inside the brewpub, again I was surprised at how clean everything looked. 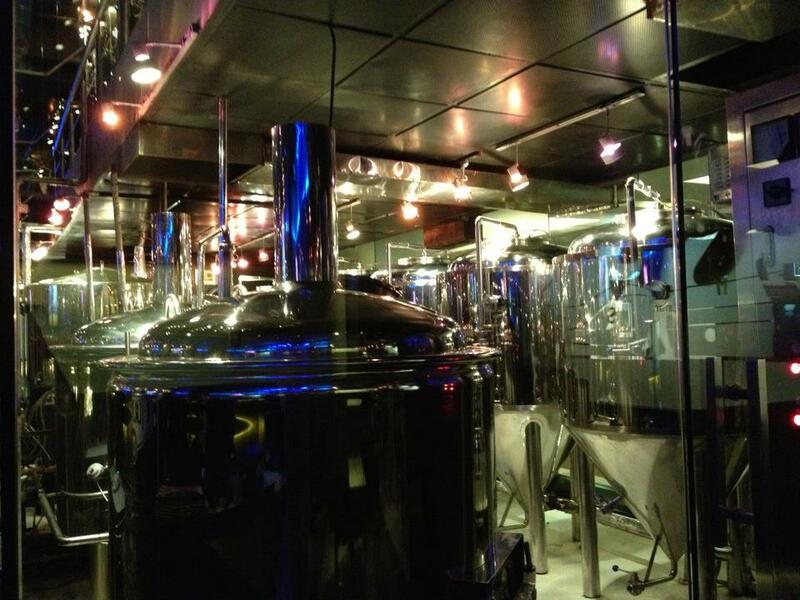 The brewhouse behind the bar was probably the cleanest I’ve ever seen, with the exception of the one at Liquid Bread Brewing Company in Hays, Kansas. As for the rest of the place, it was a cricket-themed bar with several HDTVs showing cricket or other sports. Luckily when we were there, we got to watch Olympic boxing where an India boxer was fighting, although Rob and I seemed to be the only ones interested. (He won, by the way, but since it wasn’t cricket, few people cared). 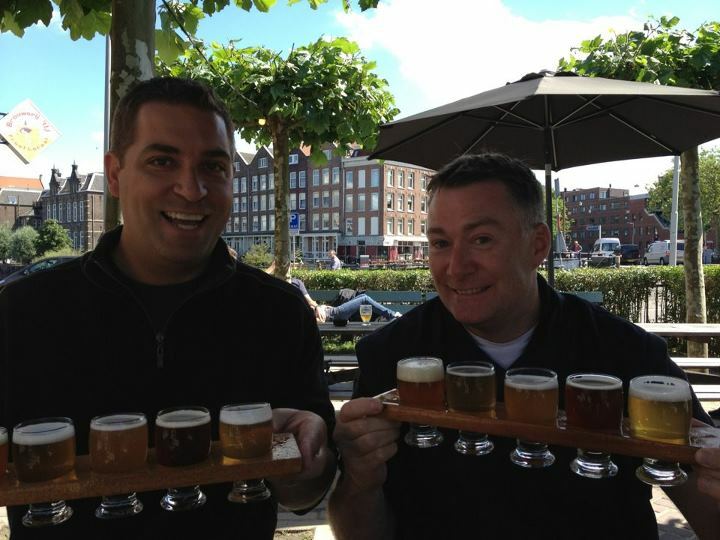 Rob and I sat at the bar, and after the ride, we skipped the samples and dove right into full mugs of their beers. The first one we ordered was Doosra, a pale lager. As I stated earlier, that is not one of my favorite styles, and having been drinking the same style for the previous week, I figured I’d get that one over with. To my surprise, the Doosra was actually really, really good. I really enjoyed it, and much more than any of the other beers that week. Rob enjoyed it a lot too, and we finished it pretty quickly. Next up for us, we tried the Googly, a wheat beer. Another beer that isn’t one of my favorite styles, but again, Howzatt pulled it off. Rob agreed, and again, it didn’t last us very long. It was very tasty and extremely drinkable. Bouncer was the last beer we ordered, and it was the one I was looking the most forward to, mainly because it was different than anything else. It was their “dark beer” (a Vienna-style lager), and it looked really good. Luckily, it tasted the same. I really, really enjoyed it. Rob did too, although I think the Doosra was still his favorite. Bouncer was definitely my favorite, and I only wish they sold growlers of it that I could have taken back to our hotel. But since that wasn’t the case, we just hung out and had a couple of more before heading back. It was easily my favorite place in India. Well, second probably, behind the Taj Mahal, although it was a lot easier to get to, plus I got to drink beer there. I’m pretty sure that Rob agreed, as he went back there a couple of weeks later with a group of guys who arrived after I returned home. 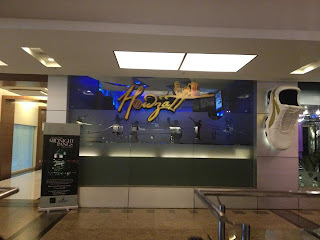 I am not sure if I will be going back to India anytime soon, but I know for sure that if I do, I’ll definitely hit Howzatt again. Probably a couple of times. For my second day in Europe, I wasn’t worried about going to another brewery. 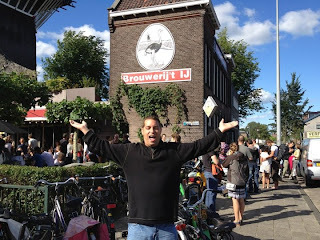 Especially since I only had one day in Amsterdam, and I wasn’t going to make it just about beer. So again, my friend Mike, his wife Willemijn, and I headed that way. The trip took about 45 minutes, so we got to the city around 11 AM and just walked around the town. This isn’t a blog about cities I’ve been to, so I won’t say too much about it, but I loved Amsterdam. Absolutely loved it. It’s just an awesome town. We did walk through the Red Light District, and since it was noon on a Friday, it wasn’t crazy or even as “dirty” as I’ve been told it was. It was basically some alleys off of the main streets that did have women in the window, but it was pretty tame in my opinion. I am sure it gets crazy at night, which would be interesting to see, but I didn’t really need to see whores and I don’t do drugs, so the walk-through was fine. After that, we walked over to the train station just to check it out, as it is beautiful building. We grabbed some lunch, and then decided to take a canal tour. I know that that is a pretty touristy thing to do, especially for Mike and Willemijn who live in the Netherlands, but they were up for it. And it was tremendous. I liked it a lot more than I thought I would, and I would definitely recommend anyone to do that if they ever go there. When we got done with the tour, they asked what I wanted to do. I said that my friend Travis suggested a brewpub to me that we could check out if they wanted, but that I was down for anything. I wanted to at least see the Anne Frank house, but I didn’t need to take the tour if it was busy. 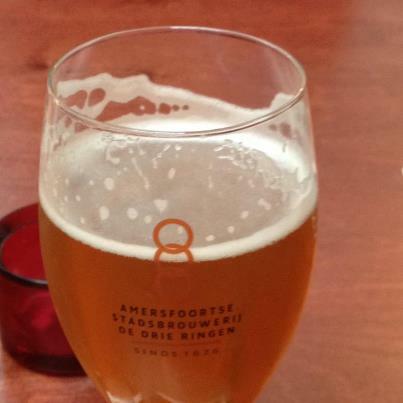 They both said that since their kids were at Willemijn’s parents’ house, that a beer or two would be nice. 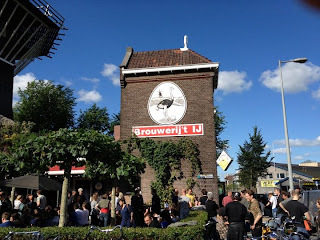 So we decided to head over to Brouwerij ’t IJ for a little while. I am glad we did. Mike and I each got samplers (he shared his with Willemijn), and even got a couple of cheese plates. Every beer was fantastic, even the styles that I normally don’t enjoy like their Plzen (pilsner) and Ijwit (their wheat beer). Of all of the beers they had, I probably enjoyed their Struis (which was only available in bottles) the most. It was a Belgian Strong Ale, and very tasty. Their Columbus (Belgian Pale Ale) was solid too, and paired well with the cheeses we had. The vibe of the place was incredible as well. We got their early on when they opened, so we were able to grab a spot at a picnic table, and as we sat there, the place started to really fill up. They offered tours on Friday afternoons at 4 PM, but we decided that we were fine just having our beers at the table, so we passed on that. We ordered a couple of more beers, since it seemed like Mike and Willemijn really liked it, and it was definitely a place I could hang out at all day. 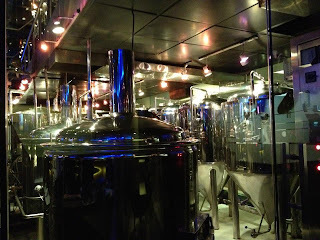 It was one of my favorite brewpubs I have ever been to, and was just a great time all around. 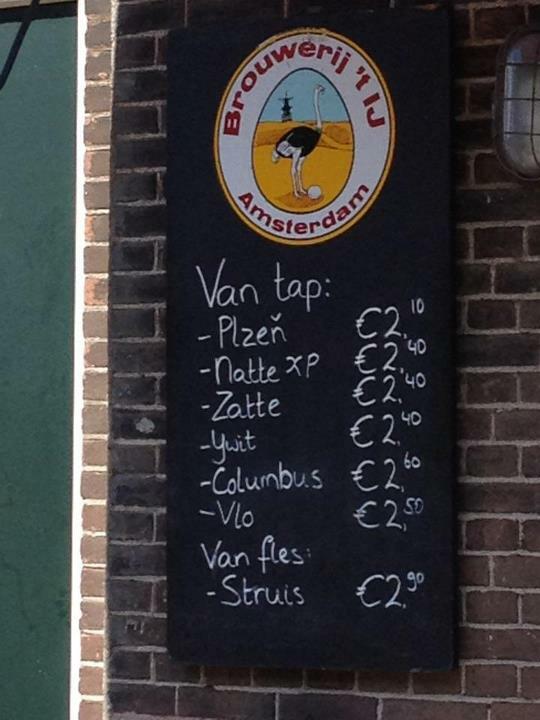 I definitely want to go back if I make it to Amsterdam. After that, we went over by the Anne Frank house but didn’t take a tour as the line was way too long. We took some pictures and then went down the street to have a nice dinner. When we finished dinner, we found a postcard at a store and I wrote a drunkenly handwritten postcard to my family that my wife has made fun of me about a half dozen times since I’ve been back home. It was getting late, so we decided to head back to their house. 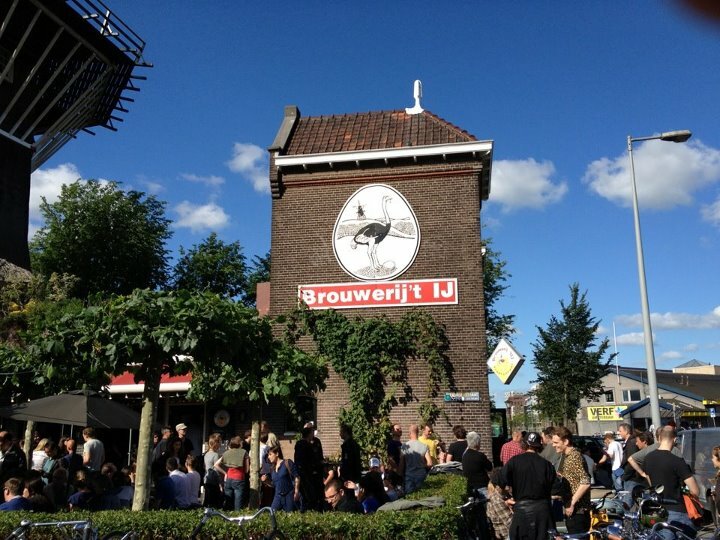 When we got there, we drank a couple more of the Dutch beers we bought, along with one of Mike’s Cantillons. We had to leave their house for the airport at 4 AM the next morning, so even though I don’t think any of us wanted to call it a night. We did. And just to be clear(as if I wasn’t already), it was one of the best days of my life. Great time!